For years folks have asked..."Why don't you have a power supply of your own?" We had a lot of excuses. The main reason was that we felt there were plenty of great power supply choices out there, and there are! But over time we saw a need for a super quiet, primarily 9volt supply with a few innovative optional features. So we partnered with the brilliant electronic engineers at Creation Audio Labs in Nashville and are now proud to introduce the Powertrain1250. 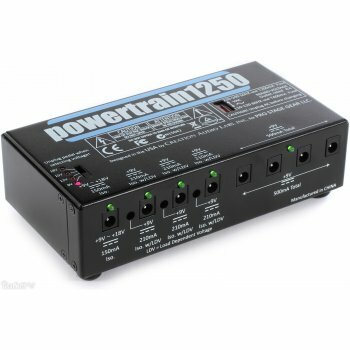 With selectable input voltage (115v or 230v)operation you can confidently use your powertrain1250 anywhere in the world! The powertrain1250 mounts conveniently underneath all pedaltrains (excluding NANO and MINI) by simply drilling 4 small holes using our custom designed mounting template. No mounting brackets necessary!